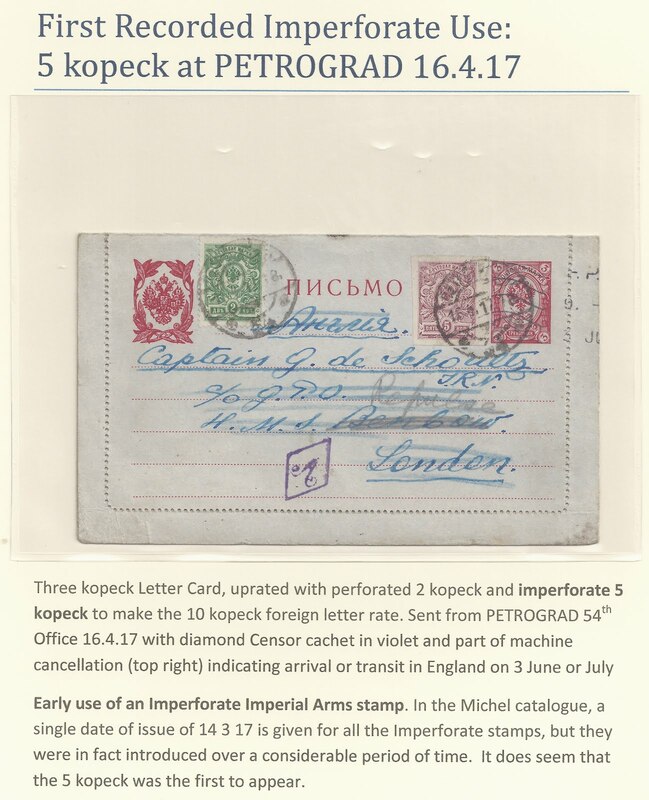 At this year's Briefmarkenmesse Sindelfingen (Stuttgart)25 - 27 October, the Russia collectors' group ArGe Russland (part of the Union of German Philatelists, the BDPh) is organising a 100 frame exhibit of Russian philately for the "Russland-Jahr in Deutschland 2012 - 13". I was asked to contribute a small Exponat. 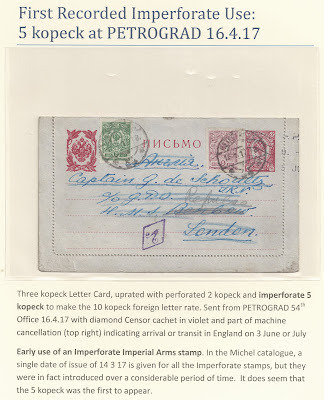 I plan to show early use of Russia Imperial Arms imperforate stamps in 1917 - 1919 when they were used at face value. After Sindelfingen, I will put the Exhibit onto this website. For now, here is just a sneak Preview of one sheet. I have a reason for choosing this sheet. I cannot believe that this is the earliest use of an imperforate stamp - though it is the earliest I have found. So I do not want to go to Sindelfingen saying "First Recorded ..." and then someone comes up to me and shows me an earlier example, which I think someone can do! Do any of my readers have an example of use, philatelic or non-philatelic, earlier than 16.4.17? If you scan me [.jpg] your example at trevor@trevorpateman.co.uk then I can show it here with comment and acknowledgment. Maybe we can have some fun over the next couple of weeks!